This “hole in the ground” can usually be found on the edge of a forest, where it will connect itself to the tree roots and use them to acquire liquids to grow. I can also be found near natural springs or lakes and even in dry areas, as long as it can reach the ground water. Once it matures, it will launch three slime balls which we call Collectors. 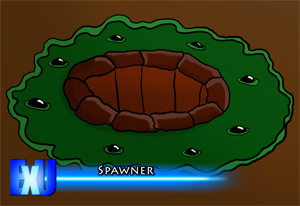 As the name implies, these will collect resources for the Spawner to consume. As a defense system, it will always have three Collectors stored. These will launch once it detects movement. It is believed the black orbs growing on the green slime are some kind of sensory system. When it has consumed a certain amount of resources, it is capable to spawn a much larger slime ball which we call a Searcher. This new spawn will seek out a large liquid source to transform itself into a beacon for other alien life forms to be attracted to a the planet it is on.